RPF Recruitment Notification 2018: Railway Police Force or the RPF examination is conducted annually by the Railway Recruitment Board (RRB). The exam is conducted to recruit applicants for the post of Constables and Sub-Inspectors. The board selects both male and female candidates for the available posts in RPF. The board released its RPF Recruitment Notification on 31st May 2018. RPF online application began on 1st June 2018 and the application ended on 30th June 2018. The RPF Admit Card for the same will be released in the last week of November. RPF exam is supposed to take place on 19th December 2018. Before the exam begins you should have an insight into the exam to get a clear idea of the RPF Recruitment process. Educational Qualification A graduation degree from a recognised university or an equivalent qualification. Nationality Indian nationals can only apply for the exam. i) Visit the official website of RPF: indianrailways.gov.in. ii) Click on “Direct Online Application” link. iii) Select the Group you want to apply for. iv) Register yourself by entering your “Personal”, “Educational” and “Contact” details. v) The registration details will be sent to you on your registered mobile number and email id. vi) Open the application form by entering the credentials sent to you on your mobile and Email. vii) Validate your “Age” and “Educational” details. viii) Fill in your “Personal” details. ix) Upload your scanned “Photographs” and “Signature”. x) Now proceed to the payment option and make payment of RPF application fees. xi) Download the confirmation page and take printouts of the same for future reference. It is mandatory for applicants to get through the Physical Efficiency Test in order to go to the next stage of selection. RPF Hall Ticket will be released separately for all the stages of RPF exam. The release of CBT admit card will be followed by the release of Physical Efficiency Test admit card. The admit card for physical efficiency will be issued only to those applicants who get through CBT. RPF admit card will be released online on the official website of RPF. The hall ticket will be released online and there will be no offline hall ticket sent by post. 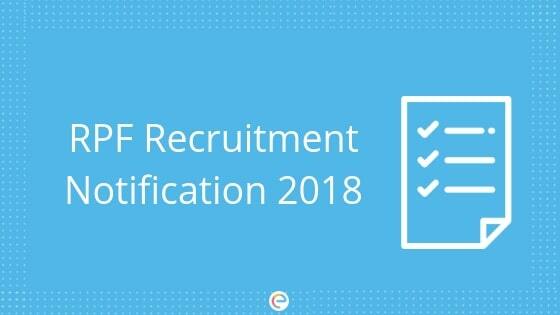 Now that you have all the necessary information regarding RPF Recruitment Notification 2018, we hope you do not face any issue with your RPF Preparation. Take as many mock tests as you can. You can take RPF Mock Test Series on Embib) to sharpen your paper solving skill. These tests have more or less the same syllabus as that of RPF exam. This will help you in managing time as well. If you face any issue regarding RPF Recruitment Notification, do drop down your queries in the comment section below and we will get back to you at the earliest.